Twinings of London Tea. The British take their tea very seriously, now you can have that same commitment to excellence with your Tassimo Professional Brewer! Full, Rich and Fast. A surefire hit in the office or workplace. Note: Tassimo Pro discs will not work with Tassimo Home brewers, and vice versa. 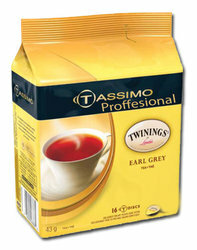 Tassimo Professional products are for commercial applications only. These products can only be sold and used in conjunction with Tassimo Professional Brewers obtained through us in Metro Atlanta, Ga.